Everyone has always been raving about Cheesecake Etc, but I had never been there despite me being a dessert junkie! So I finally got to on a Friday night, and the place was packed! The place was pretty big though, so we were able to grab a seat after waiting for about 5 minutes. To my surprise though, they barely had any varieties to choose from. It was either, Original Cheesecake, Chocolate Cheesecake, Cheesecake with Strawberries, Chocolate Cheesecake with Strawberries or Gourmet Special. 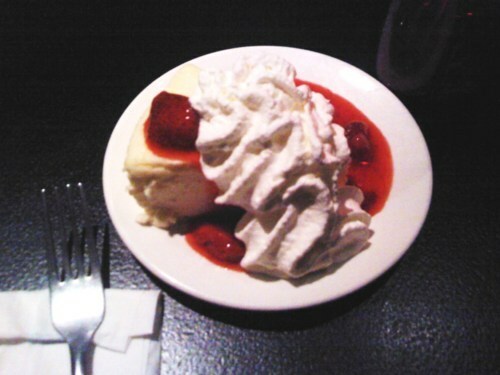 So I decided to try the Cheesecake with Strawberries. It’s pretty good, but I didn’t think it was the best thing ever. I probably would prefer going to the Cheesecake Factory in the states and ordering a variety of different cheesecakes instead. Maybe I just like to try more unique desserts, but if you’re someone who likes the original cheesecake, then this is the place to go, at least in Vancouver!